The best part of living in Union Square is how close I am to St. Marks. I have several staples that I usually end up at but occasionally I try to branch out and try something new. 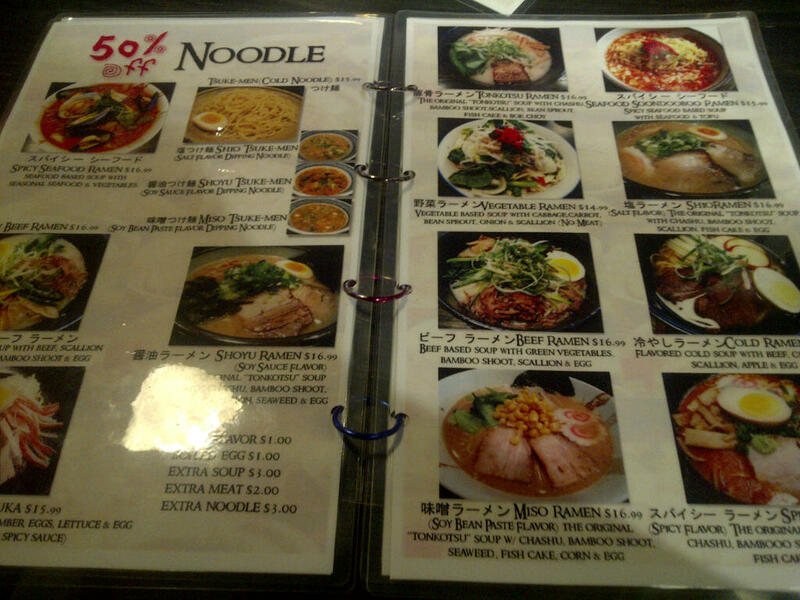 This time I decided to give East Noodle (Ramen and Robatayaki) a try. Just like every other smart diner, I did a quick search on Yelp for East Noodle before I committed. Surprisingly, Yelpers gave it a 2.5 star rating! I usually put full faith in Yelp and would stay away from places with 3 stars or less, but something about the “50% off all ramen” signs (I like a good deal what can I say?) 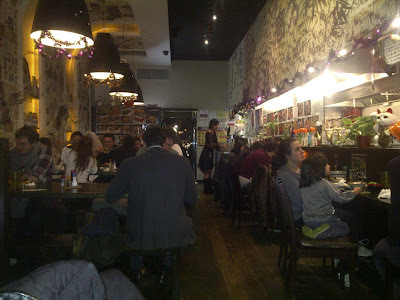 and the bustling atmosphere inside the restaurant encouraged me to take a risk. Despite the low yelp reviews, East Noodle is moving and shaking inside! 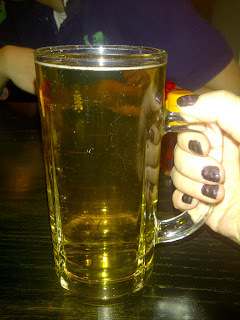 First order of business after being seated: order a $2.50 glass of Sapporo draft. Score! Second order of business: peruse the menu and decide what to get (Note: The Sapporo and ramen special is only valid Mon-Thurs!). 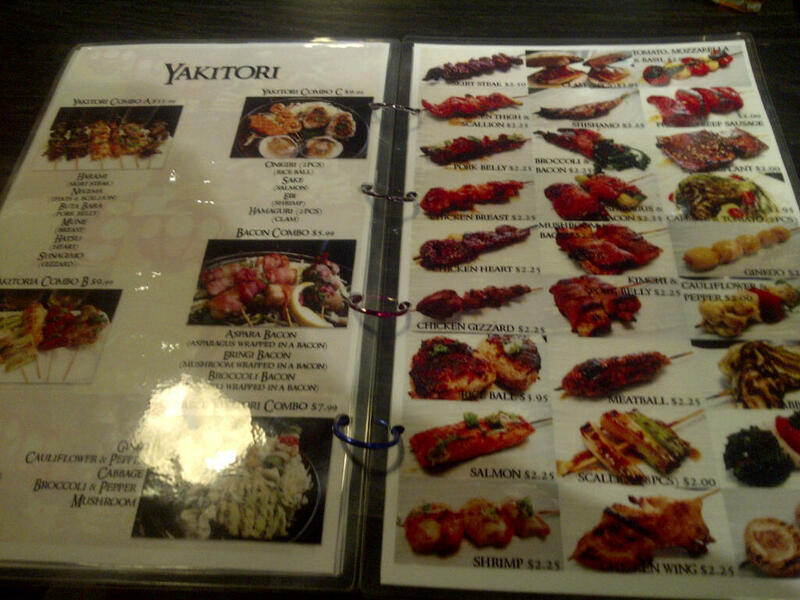 I love that the menu has a picture for every item and is neat and organized. Nothing like ordering by color! 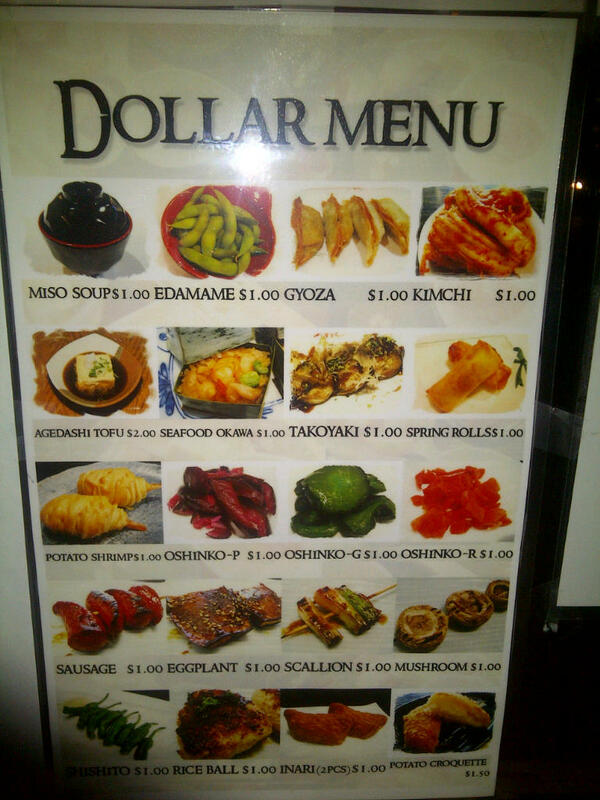 And there is also a dollar menu available for those who wish to dine extra economically. Love all the pictures on the menu! With most ramen priced between $14-16, the “50% off all ramen” special brings the price down to $7-8 which is what I would expect for St. Marks. While not exactly a complete steal, I’m still happy to be here on a weekday instead of paying full price on the weekend. 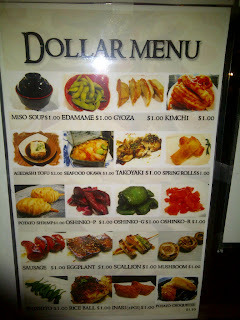 ﻿ From the dollar menu, I ordered the spring rolls, seafood okawa and a miso soup. 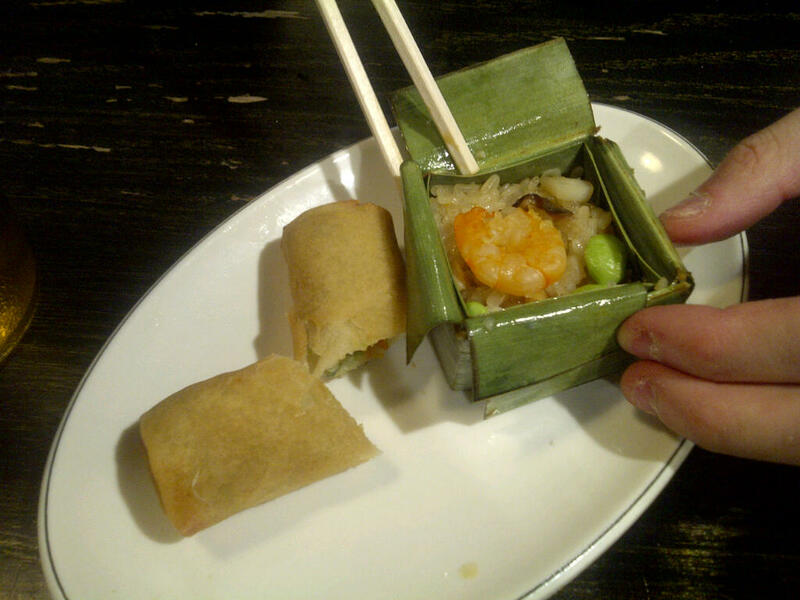 The spring rolls were hot, crispy, and had good flavor but you only get one (poo). The seafood okawa (very similar to the glutinous rice dish you get at dim sum) was very fragrant and came with one shrimp and some veg but it was maybe 3-4 bites worth. Overall, the dollar menu items were tasty but definitely small portioned. 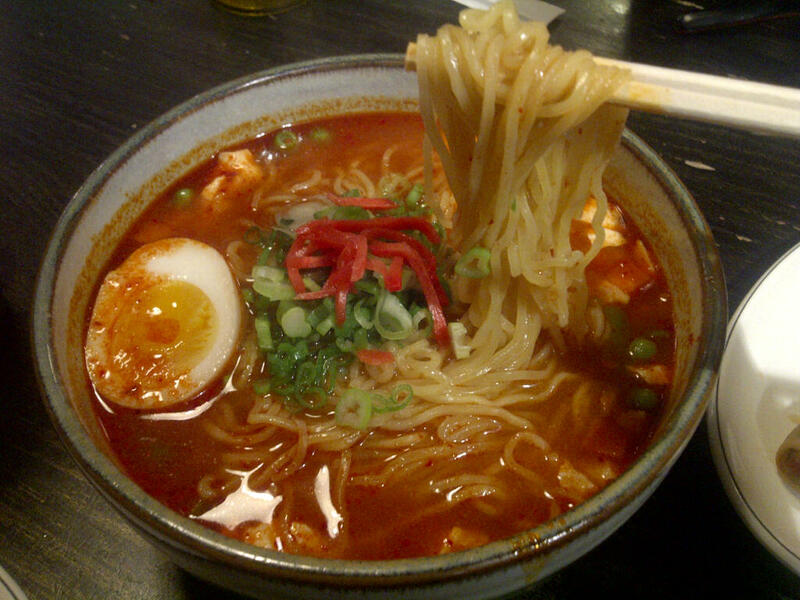 ﻿ For my entrée I ordered a Spicy Seafood Soon Du Boo Ramen. There wasn’t a lot of tofu but the broth was spicy and flavorful (did not taste watered down like some places). There was also a healthy serving of chewy ramen noodles. I asked to add an egg and it was perfectly done. Overall, this is a hearty and filling dish that I'll definitely be returning for. At the end of the day, I’ll admit East Noodle does not check the box for authenticity (unsurprising as we were one of the very few [if not only] Asians in the restaurant). If you are looking for a genuine high-quality Japanese experience, this is not the place for you. 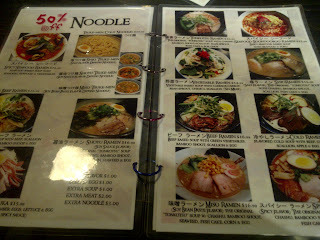 But if you are looking for something that is affordable, quick, and tasty, East Noodle would be a great place to try. This will not be my last trip here – I’m looking forward to giving it another go (on a Mon-Thurs of course)! Pumpkin Bread and Happy Thanksgiving! Blast from the Past: Boston Market!